This Memorandum is focussed on how to use the weight of evidence approach (WoE) to conduct a risk assessment for stressors to which humans and/or the environment may be exposed. It is intended to complement the Scientific Committee on Emerging and Newly Identified Health Risks (SCENIHR) report on the identification of emerging issues and the work on the challenges in future risk assessment. 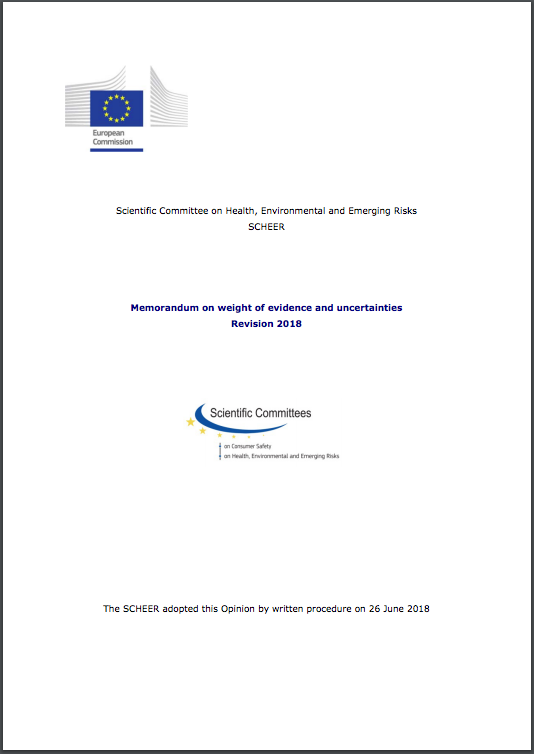 The aim of this document is to support the use of the WoE, wherever appropriate, for the risk assessment activities of the Scientific Committee on Health, Environmental and Emerging Risks (SCHEER). In addition, it should support the consistency in the work of different EU bodies performing risk assessments.